Would this be acceptable in the US? Would it be anti-semitic of me to deplore the slow abandonment of democratic principles by Israel’s Jewish population? I would have quoted a different passage in Gary Glass’s commentary today but the link at the Trib isn’t working at the moment. I’d have posted the paragraph about reelecting a new school board. It was no wonder School Board member Mary Cameron came off as miffed in a May 10 News Tribune story after hearing that negotiations with Duluth’s new superintendent had begun without her. Apparently she had become disconnected from the rest of the old majority. Disconnectedness describes the School Board’s relationship with the people of the district, illustrating the reason this School Board is broken. Yes, broken, and disconnected. The bottom line is lawmakers failed. You had one task to get done and four months to do it. But you bickered and talked about other things and didn’t get much done at all for long stretches. And then you left the state capitol late Monday and early Tuesday without a budget deal or even anything closely resembling a deal. I wonder if the local Editorial Board wrote this or the masters in Fargo Communication who gave a blanket endorsement of Chip Cravaak and Sen. McCain in every one of their stable (that’s a term a pimp might use) of Minnesota newspapers in 2008. My guess is that the Forum papers were kind to the state legislators that the DNT is now lamenting. Whoever’s responsible Gov. Dayton is given a pass by the Trib. I pass him too. He got elected to veto a no-new-tax-increase budget. As for the voters they elevated the Republicans who were most caught up in the Tea Party euphoria of disgust with the Government – except for the entitlement part. Having split the government between two sides that were elected to be uncompromising I guess its the voters who should bear the burden for indecision. Oh, I’m not giving a pass to the dittohead, group think of the GOP. I’m simply a purist. I believe voters are entitled to endure any foolish consequence resulting from their votes. For instance, had we voted for the Red Plan in Duluth no one could complain with much credibility about its profound injury. I guess that’s my complaint with the Trib. They played their part in electing the gridlock. Its just not clear whether the blame lies in Corporate Central or in West 4th Street. The Red Plan which began as a way to close a high school, morphed to a long range plan then to a way to lure students back to Duluth then to an energy savings and efficiency project and finally to a means of injecting vigor into Duluth’s economy is finally winding down. The economic stimulus part, except for the bond holders which will be collecting our repayment for the next twenty years, is coming to and end. This comes from today’s story on our anemic jobless rate. “Some of the big construction projects that were helping us keep ahead of the game have run down,” Digby said. A big chunk of the Duluth school district’s building projects are done, as are Amsoil Arena, the Enbridge pipeline expansion and mining company upgrades, he noted. A few Red Plan projects remain while some of the biggies finish up. Sure, lots of the people employed lived elsewhere and will be taking Duluth’s money home with them but there’s no question some of the $293 million spent on dubious buildings has added life to the community even as the Red Plan itself has driven ten or more percent of our students out of our sparkling new school facilities. What else made me a RINO? Just look at any of the long list of issues on the right hand side of this blog and you will see issues that I think the GOP is positively hair-brained about. Lincoln himself would be drummed out of the Party. Damned state’s rights interfering, pro science, big government, civil right’s fanatic and agnostic. And he wrote poetry too! To be honest I don’t want the amendment on the ballot either. However, I fully agree that the GOP has every right to put it there even if it is doing so to drum up more GOP votes rather than to protect the sanctity of marriage. I’ve thought about putting up a hand made lawnsign in my yard saying something like this: Repeal the anti-gay marriage amendment in 2020. It would broadcast one more of those issues that is slipping out of the fingers of the GOP hacks. At the rate things are going for the GOP Minnesota might not need to repeal the amendment in ten years. I think the GOP is bringing so much discredit on itself that this amendment could bring out more anti-GOP voters just to teach the hacks a lesson. I’ll enjoy that if it happens. If it doesn’t I’ll help circulate the petitions to repeal the gay-baiting amendment in a few years. Regarding abortion, maybe Republicans aren’t as out of step with their fellow humans as you seem to suggest. I resolved a few days ago to stop endless tendentious email exchanges once I’d passed the “lets agree to disagree” point of any debate. However, this is the second reply I’ve composed but emailed to myself alone (and in this case posted to the blog). It would drive me nuts to ignore such email but it would drive me even nuttier to commence an endless circular exchange of repetitive emails. Emailing myself is a compromise for sanity. I’ll still read interesting links sent to me and I did find the link in this email interesting and hopeful. As the existing GOP keeps sealing itself behind a brick wall from the growing majorities of voters taking over the nation I expect that there will be other issues that will continue to turn the tide against the Grand Old Party. Sadly for a once proud Republican I’ve long agreed with many of these tide turning issues. But then, Republican Eleventh Amendment notwithstanding, I was just a RINO. Now I’m not. Meanwhile JCI building costs are . . . Although the district as a whole remains under budget, the Cherry School exceeded its construction budget. Costs for that project are expected to total $10.479 million. The school’s original budget was $9.9 million, but was later supplemented with an additional $400,000 from the district’s contingency fund. Even with the additional money, Anderson said the project is expected to be $179,178 over budget. Court to rule on whether the St. Louis Co School Board . . .
. . . spent money illegally to promote their narrowly passed JCI building plan. An attorney for the St. Louis County School District had a rough outing before a three-judge panel of the Minnesota Court of Appeals last Thursday, May 12, as she tried to defend the school board against allegations that it violated the law when it spent tax dollars to promote a yes vote in the Dec. 9, 2009, referendum and failed to report it. Unfair and Unbalanced . . .
. . . but not complete idiots. 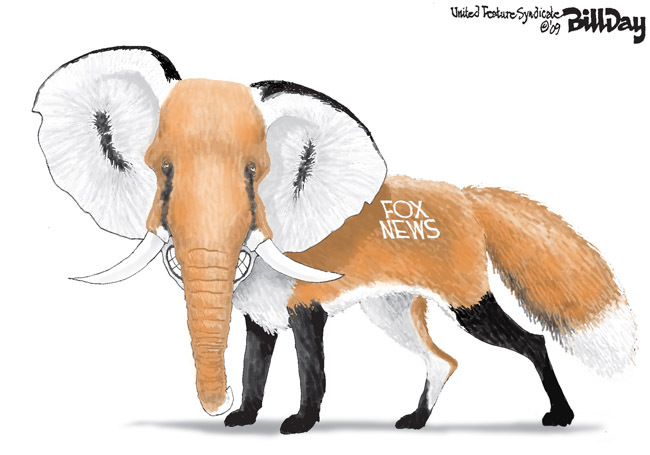 The Fox in the hen house. A decade ago I was pouring over old newspapers from the time I was in college back in the 1970’s and was struck by the huge number of news stories about how dire the poverty was among the elderly. No more. Now the elderly are taking enhanced Social Security and Medicare benefits and joining the Tea Party to fight socialistic tax increases. Meanwhile schools are filling up with children whose parents are preoccupied with survival not their children’s GPA. The falling sky blue line shows the decrease in poverty among those over age 65. The rising yellow line shows increase in poverty for children under the age of 6.
. . . are busy alienating the people who elected them last year. Don’t blame people . . .
. . . Polar bears. are passing too much gas. That’s the election year that Republicans will be trying to beat President Obama’s would-be Democratic successor. Al Gore Maybe! Fox news warns us that Obama . . .
. . . is doing exactly what George W. Bush and Bill Clinton were trying to do…….abandon Israel (apparently). They just don’t mention Bush or Clinton. So I’d like to point out another shocker – Sarah Palin at 8 months pregnant the fifth time compared to the first time. If she’d just do a video showing other Mothers-to-be how to stay so slim she wouldn’t have to shill for Fox News and she would make a lot more money. If you thought I was kidding about Horcruxes this is one more of them. “Let me tell you what I think about moderates. Even Jesus had a problem with moderates. He said, â€œYou are lukewarmâ€“neither hot nor cold, I will spew you out of my mouthâ€. In other words, for crying out loud, have the backbone, character and conviction to take a stand for something. The liberal media wants to set us up with another moderate linguine to lose AGAIN! If you haven’t read the satanic Harry Potter series a horcrux is a magical amulet used by the arch villain, Voldmort, who attempted to give himself eternal life by dividing his soul into seven pieces and placing each fraction in the amulets and hiding them. Only once all seven had been found and destroyed would Voldmort die.